Sat in front of the log burner on a sunday afternoon with the rain lashing at the windows, and feeling happy that I have a few weeks of good training banked after what felt like months of annoying random injuries at the tail end of 2017. Also I have discovered lots of great food – and retain my love of cake!!!!!!!!!!!!!!!!!!!!! I plan to get some more when I am on the cuckoo trail in the next few weeks. If I stand back and look at 2018 so far, I am happy about some things and reminded that I have a long way to go before I hit the canal races from the end of May. But it feels like a long time away while the weather in January is so rubbish!! But come the spring I am sure I will be whining like a baby about having to train in 20 celcius! A new 10km PB – which I got at Runthrough at Battersea on the first weekend of 2018. I don’t run 10km races often…. I think mostly because of the lack of cakes and snacks during the race. Anyway, while I made a 1 minute PB – 47:02 and a beautiful negative split which I have never never ever ever achieved before. I was happy with it wasn’t quite the sub 42 that I was planning when I signed up in October with the expectation of injury free training! Anyway, the benefit is that I get to go achieve some more PBs at some point and I can eat even more cake to celebrate! Why would anyone want to just have on celebration by achieving their dream time the first go around!! It was well organised race too – with the starting funnel filled as it should be in pace bands. Long runs are back. 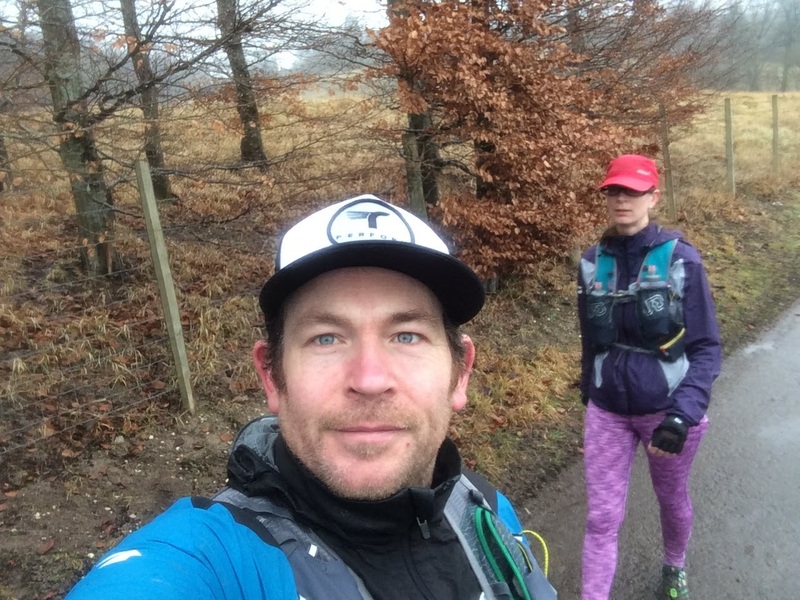 I am currently on 18-20 mile long runs and that means that I get to have hours of fun in my favourite playground of the north downs, south downs and the cuckoo trail depending on whether I need hills or the flat uninterrupted stuff. LOVE the hills – even when they are covered in mud! My wife is also training for a march marathon and then a 50 miler later this year so she is joining me on some of my training runs. I am so happy to be able to run with my wife. It is the best gift ever. Also means that I get to ogle her bum for hours on end 🙂 Did I write that? OOOOOps —– BAD boy! Intervals – I have really embraced the 400/800 intervals and the longer 2 mile long tempo segments amidst an otherwise easy sesh. I’ve seen the benefit in terms of my pace and my general fitness. I hope I will get some chance to get a new Parkrace PB when I am properly on form. I have also been able to figure out how to set up my training on my watch. Basically I am a numpty and have no memory – so short of writing it on my hand I think having it on my watch is a more socially acceptable alternative. It also means that I can just focus on running and just do what my watch tells me to. The benefit too is that on intervals I can see how fast I have run those specific sections. Good for feedback. Running with friends – I’ve also had some lovely run with the local Egerton runners, and some runners from work. It’s great getting out with others and having a chit chat about training and how things are going with their training. And I have of course a small messenger group with some good friends who are training for various things so good to share tips between us. I’ve also had a run or two with a mate of mine Lee who is doing the Arc of Attrition in February. I think he is NUTS! Polar OH1 heart rate optical sensor which fits just below the elbow and is much much more accurate than either the wrist based sensor from my garmin. I don’t have the stupid erratic heart rate from my chest strap, and I don’t have to have my watch fitted just absolutely correctly to get a good heart rate fix. Wish the battery lasted a bit longer – and that I could charge just once a week though. I also love my Y-fumble arm pocket which means that when I do runs from work without my pack I can chuck my work security pass and phone in there. Better than a waist pack, better than those stupid phone arm holders too. The only thing I find is that sometimes it is difficult to get my phone out easily – which means that I guess it is probably quite a good design! How has your January gone so far for you? Previous 2018 plans and why you’ll find no Revolutionary Resolutionist here!